Hudl Focus is the hands-free smart camera that takes the hassle out of filming. Coaches are constantly evaluating the athletes entrusted to their care and developing ways to help them improve. Good coaches do the same for themselves. In an article on the USA Volleyball coaches education site, http://www.teamusa.org/USA-Volleyball Corey Radford from the USAV’s Florida Region offers advice for optimizing your coaching mindset. Here are a few of the highlights. Radford says the ability to maintain self-control and perspective during practices and games can be the difference between being a good coach and a great coach. He goes on to offer a few tips for doing this. One is to always act as if a news crew is filming or that your mother is watching. Another is to have realistic goals and focus on improvement instead of just performance. One of the most interesting is to remember the times in your life when you struggled to learn a new skill. He later suggests giving athletes plenty of room as they’re learning new skills. Correct any errors with short and concise instruction then let them get the hang of it. As long as they’re not developing bad habits and they’re making fewer mistakes as they go, that’s progress. Before practice or games, take a few minutes to collect your thoughts. He suggests putting aside 15 to 20 minutes to go over things in your head. The idea is to imagine potential problem spots and work out the best response beforehand rather than reacting in the heat of the moment. He also uses this time to write down some of his key thoughts for the upcoming session so they won’t be forgotten in the flurry of activities that make up games and practice. 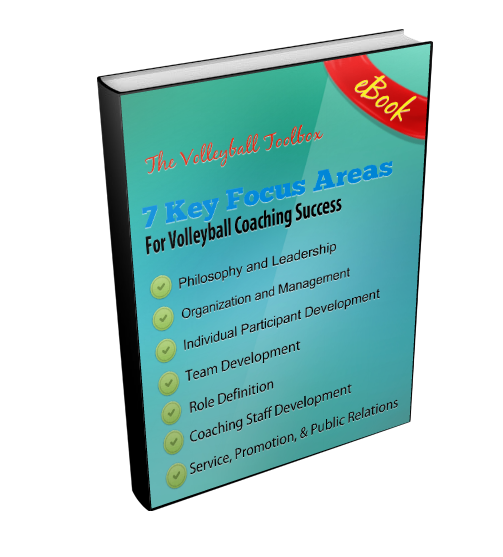 “I have found that it helps me to compose a short list (1-4 items) of coaching reminders on a scrap of paper and then keep it in my pocket during the match. The list might be purely strategic in nature (i.e. call serves), purely mental (i.e. don’t yell at the ref) or a combination of both. I have found this strategy to be effective because I am emotionally collected and focused when I write the list and so it helps me regain focus during the match.” He also keeps a pen in the same pocket as the piece of paper so he’s reminded of these cues whenever he goes to make a note. Exist in a state of constant re-evaluation. Radford says he’s always excited after games to start looking at ways to improve before the next one. He explains that evaluation requires two steps. First, is knowing what is important and what’s not. In volleyball, for example, fixing a poor service game is more important than correcting defensive footwork. Second is knowing how to spot what is being done incorrectly during games. He also reminds coaching the evaluation isn’t just for players. He regularly writes down his own list of weaknesses and prioritizes that are most important to address. Principles can vary from coaches to coach, but Radford says “coaching without a strong set of written principles is like hiking in the woods without a compass–you may eventually get where you’re going, but the trip won’t be easy and there’s a really good chance you’re going to get lost.” He explains that some principles, such as morals and ethics, come from the heart. Other will come from science, such as why you choose to teach a certain skill a certain way. Be more organized than even the best coaches. One of Radford’s biggest tips here is to work hard on your practice plans. Even though it takes a lot of time and effort to write out a posted plan for everyone to follow before each and every practice, he says it will pay enormous dividends in the development of your team and you as a coach. Have fun and be positive. Video touches every part of sports in the modern climate. Here’s why it matters and how all coaches should use it. We know the value of video at Hudl. It’s the bedrock of our company, the cornerstone we’ve used to build our entire structure. At this point, most coaches also see video’s value. They understand it can be used as a scouting tool or a way to correct mistakes. Click here to discover game-changing insights with video. The power of video is nearly limitless, and we’ve heard the proof. Coaches have told us it saved their season or played a key role in an upset. We’re here to help you fully understand the capabilities of video and the effect it can have for you this year. Don’t believe it? Trust the words of Brett Woods and Brett Haskell, athletic psychologists at the University of Nebraska. But the stats sheet only goes so far. While the data can provide useful information, linking it to video provides much greater context. With Hudl, one click is all that separates a coach from a statistic, and a corresponding playlist of the video clips tied to that stat. It’s key to address your own team’s needs, but dissecting your rival’s game plan can be just as critical. Just ask Ryan Grates, an assistant coach at Cape Fear High School (N.C.), who scoured the video and discovered crucial tendencies that allowed the Colts to win the East regional championship. Finding a key tactical edge in your scouting can be the crucial component that gives you a leg up on the competition. It plays a huge part in the process for USA Basketball. With a hectic tournament environment and little time between games, former assistant national team director BJ Johnson relied on video to get Team USA prepared for each opponent. And the more athletes you get recruited to top programs, the more your program is elevated and your reputation strengthened. We could go on and on about the benefits of video, but we think our point has been made. Video is the connective tissue in the modern sports landscape. It helps communication with players, gives visuals to stats, gets athletes recruited and helps you find the holes in your upcoming opponent’s strategy. Video is the present and future of athletics. Sign up and get a free mobile analysis kit, which includes an iPad, tripod, mountable iPad case, HDMI cords—basically everything you need to record and analyze your matches.